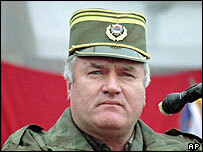 Serb nationalists have warned Belgrade not to hand over General Ratko Mladic to The Hague war crimes tribunal. About 10,000 Serbian Radical Party (SRS) supporters rallied in the Serb capital chanting slogans and carrying pictures of Gen Mladic. "Mladic is the pride of the Serbian nation and not those who have been in power," said SRS MP Natasa Jovanovic. The protest comes amid reports from Serbian media suggesting that Gen Mladic may be ready to give himself up. He has been indicted over the siege of Sarajevo, which claimed at least 10,000 lives, and the 1995 Srebrenica massacre, in which at least 7,500 Muslim men and boys were killed. SRS party official Aleksandar Vucic said there would be "no forgiveness" for anyone who surrenders Gen Mladic. The demonstration was organised to mark the third anniversary of the voluntary surrender of SRS leader Vojislav Seselj to the Hague tribunal. He is being held in detention and faces charges of inciting ethnic hatred during the Balkan wars of the 1990s. The EU this week warned Serbia that its talks on closer ties with the EU would be disrupted if it failed to co-operate fully with the war crimes tribunal. Serbian Prime Minister Vojislav Kostunica insisted his government wished to be a "credible partner" of the EU and said it was determined to hand over Gen Mladic. "The Serbian government is doing all it can to fulfil the international obligations toward The Hague tribunal," he said in a statement. Meanwhile, in neighbouring Bosnia, demonstrations have been held in support of a lawsuit seeking reparations from Serbia and Montenegro. Bosnia first sued what was then Yugoslavia 13 years ago for its role in the violent ethnic cleansing of Bosnia in the early 1990s.